Wesley D. Garlipp was born July 16, 1932 on the family farm near Cook, the son of Leonard and Frieda (Huhold) Garlipp. He graduated from the Cook High School in 1949 and served on various ships in the U.S. Navy from 1952 to 1956. Wes married Ardell Bremer April 21, 1961 in Talmage. He worked at American Meter and retired in 1992 after 38 years with the company. Wes was a member of the First Evangelical Lutheran Church, Elks Lodge No. 1049, American Legion Post No. 8 and Eagles Aerie No. 968 where he was a past Trustee on the Board. Wes was a master carpenter, enjoyed fishing, hunting, playing cards, socializing and spending time with family. Survivors include his wife Ardell of Nebraska City; son, Randy Garlipp and daughter, Roxie Yost and husband Brad all of Hamburg, IA; brother, Lonnie Garlipp and wife Rosemary of Buffalo, NY; grandchildren, Lindsey Yost and Sydney Yost, both of Omaha, Brittany Garlipp, Brandon Garlipp and Tyler Garlipp, all of Alabama; great granddaughter, Bradleigh Rose Anthony; sister in law, Maxine Burger of Nebraska City; several nieces, nephews, other relatives and friends. He was preceded in death by his parents; infant brother and son, Robb Garlipp. 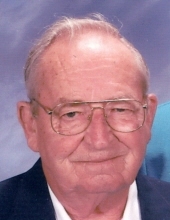 Wes died January 26, 2019 at The Ambassador in Nebraska City at the age of 86 years, 6 months and 10 days. To plant a tree in memory of Wesley Dean Garlipp, please visit our Tribute Store. The family will greet friends from 6:00 to 8:00 P.M.
"Email Address" would like to share the life celebration of Wesley Dean Garlipp. Click on the "link" to go to share a favorite memory or leave a condolence message for the family.